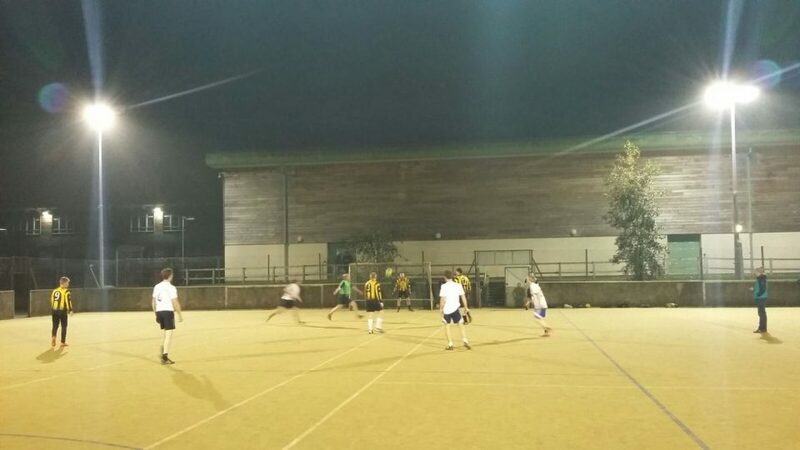 Round 10 of the 5aside league – Wednesday 14th November 2018. Newbigginners came up against a young Ingleton side that have struggled to pick up many wins, but who get the ball down and move it around well. Newbigginners quickly set the pace and tone for the fixture and scored within minutes when Dan Hallam slotted home. Ingleton replied quickly through a deflected shot from Josh Capstick, the brightest spark in the Ingleton side again. However their joy was short lived and by half time Newbigginners found themselves with a very commanding lead, 8-1 at the break. Dan Hallam added another 2 to complete his hat-trick, DJ Beecham with a quick fire hat-trick of his own, 1 Jam Robinson strike and a neat finish from the impressive Ryan Capstick. In the second half it was more of the same and Dan Hallam added insult to injury with a second half brace to take his tally to 5 for the match. Jam Robinson added a second for himself as did Ryan Capstick. There was a bleak consolation for Ingleton when Josh Capstick found the net for his second of the night, but the game was well out of sight by then and Newbigginners ran out comprehensive winners by 12-2. Dan Hallam taking the MOTM award for his commanding and ruthless display all over the park. In the other early game Garstang took on Chipping in what looked set to be a close game on paper with both teams starting the night in the bottom 3. It was Chipping, who came out of the blocks quickly, with Joe Kelsall continuing his goal scoring streak soon followed by a goal Steve Cornall and a brace from Stephen Whitaker. Garstang did manage to find the net before half time through Ben. Second half and Garstang took the game to Chipping. Dre scored the goal of the game as he dribbled past some outstretched Chipping legs, before poking home and giving Garstang hope. Ben scored his second of the game and Garstang’s third, but Chipping managed to restore their cushion as Mark Winstanley closed the scoring to give Chipping a much needed win. MOTM went to Kevin Kelsall, who made his first appearance of the season and did much of the hard work for the younger lads! At 9pm founder of SportsReach, Graham Stamford came to speak to the guys. Graham shared some of his story about how God completely changed the life and heart of a young football mad teenager. Graham shared about how following Jesus was the most important decision he had ever made and he encouraged the lads to make that step, if they hadn’t already. In the late games Capernwray were looking to continue their rise up the table as they took on Lune Valley Utd. Lune Valley Utd had a combination of retro all-stars turn out tonight with the new keeper Josh Huddleston making his debut. A little rusty but after a few games it will be like he’s never been away. Stephen Midwinter also making a rare appearance for Valley. It was a good game and the Students didn’t have it all their own way this week. Valley played well and used the experience and strength to hold the students from running riot. The game saw 4 penalties been awarded, but there was only one man able to show the young ones how to score a penalty and that was Valleys very own manager Alan Wadsworth. Both keepers made some good saves from the spot and also from open play. David playing for the students had a great game again but was just lacking someone with the same ability to link up with tonight but still managed to score three of the six goals. Even though the Students took the lead and always had the goal advantage for the duration of the match, Valley didn’t give up and Sam and Nathan were digging deep for the old fellas of the team. They fought back at the end of the game, with two late goals and maybe given some more game time they might of even pulled back a couple more but the Students knew the job they had to do and held onto their victory yet again. In the other later kick off, high flying Roeburndale Rascals came up against a Carnforth side who in recent weeks, had struggled to find the form of their early season. 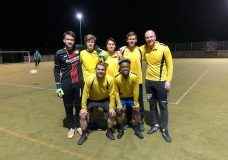 Their plight wasn’t helped when minutes into the match, an accidental back pass to the goal keeper resulted in a penalty kick to the Rascals which the in form Matthew Dawson coolly dispatched into the roof of the net. Things didn’t get any better for Carnforth and in no time found themselves 4-0 down with Will Preece and James Lawson really turning the screw, Rascals were running riot. Will Preece grabbed the second and third goals, the later an incredible individual effort consisting of a maizy run through several defenders and a fierce shot from a tight angle in off the post. James Lawson added his first of the evening and the Rascals 4th before Will Huddleston made it 5 before half time, with an excellently taken goal of his own. Carnforth replied before half time through the ever impressive Damien Kitchen, but trailed at the interval 5-1. The second half started in similar fashion with Rascals adding another through James Lawson and Will Preece completing his hat-trick to make it 7-1. Despite the deficit Carnforth didn’t lie down and continued to create chances of their own. Luke Gorst making a few good saves to keep his team in full control. Nathan Wintrip did however find the back of the net with his 1st of the night and 2nd in 2 weeks to give his side the slightest glimmer of hope going into the last 5 minutes. But all hope was extinguished when James Lawson completed a hat-trick of his own, firing in from distance to cap off a fine individual performance and a splendid team effort. Final score Rascals 8 – 2 Carnforth. James Lawson credited with the Man of the Match for his good work in both halves of the field. Thanks for the reports from Jam Robinson and David Whitfield.